All of the African handmade jewelry for sale at The Maasai Market are 100% authentic. We work directly with the skilled artisans who handcraft each item. They are paid a fair price for their work, which helps them put food on their tables, send their children to school, and provide for other necessities of life. You can feel good knowing that each purchase benefits a hardworking individual just trying to provide for their family. 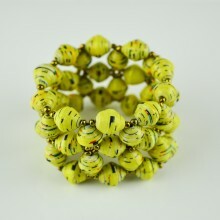 Most of our Handmade African jewelry are made from recycled materials such as cow bone, aluminium, paper, and coconut shell.